Club Penguin Cheats by Mimo777 Club Penguin Cheats by Mimo777: Club Penguin Reviewed By You and Winning Gnome?! My Favorite Holloween costume? hmmmmm? I think it would have to the skeleton costume. I just think skeletons are sooo cool! I think it's cool how I can go around the island telling this joke I made up." Hey, did you order some ribs? He he he he!" Waddle on CP and keep up the good work! 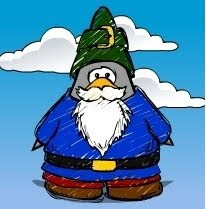 Also, Club Penguin has had lots of votes for this gnome costume. I guess it is the winner! For next week's Reviewed by you, Club Penguin wants to know what you think the most awesome costume EVER has been at the Stage. So, what is your favorite Stage costume? thats cool i liked them all maybe probley not but they will have it for nonmembers that would rock! Cool I wanted #2 to win. But they are are nice! I cant wait for halloween! is it just me or is the smoke coming out of the ski lodge quicker than usual? Can you have a party soon? I'm to bug ya but I'm SOOOOOOO bored with cp right now and I've memerized the newspaper so can you? plz? WAIT! Check the gnome penguin's colour! YAY!!! I love the fish coustume i like to run around and say someone order fish and chips? And my fravorite halloween coustume is the bee or ghost. I sometimes buzz around the island and say Boo to people! Mimo, I think CP did not count the votes correctly. If you go to the the Spanish version of the "You Decide" blog, you will see that the Red Costume had the most votes at the end. And if you go to the Portuguese version, you'll see that the Blue AND Red Costumes ARE tied with 39% at the end. And if you go to the French version, the RED Costume WON! So WHY did CP say that the BLUE won IF the other costumes won in the other languages of CP? Any mods, please help me. host a mimo haloween party party at your igloo with costume parties and stuff. OMG! guess wat i was juston cp and i looked at the catalog and the new one was there but it woudnt let me buy anything!!! it was so cool! i cant believe i just saw the new catalog! srry bout all the hyper talk im just soooo excited! when i tryed to buy something it said,"you dont have eneough coins" but i have 4,000 coins!! Hey mimo did you notice that the gnome is gray!? I think that when the new ninja hide out comes out we will be able to buy the color gray! Mimo, did you notice that the gnome costumes all have grey as their colour? I think that this means that you can buy the grey colour. It's possible but I think a more credible(likely) would be to say that they put them grey so what colour they were wearing wouoldn't matter in the vote and they want you to find the best one! I think they would of given us warning if we were getting a new colour.